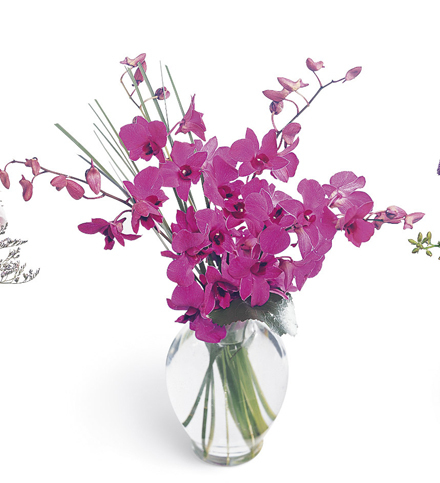 Florist Notes: Dendrobium orchids in a rich shades are accented with bear grass in a clear glass vase. Other colors are often available. Purple/White is usually in stock. Mauve, pink and green may be available. Arrangement Details: You may also add a box of chocolates, a teddy bear, and/or some helium balloons. Hand made by the local floral designer and hand delivered. Covered by the best Guarantee in the floral industry. Order flowers early for special colors.